Darren Jones admits that he has a problem with authority, which is probably why we end up being thrown out of the Smoking Room just minutes into our interview. The Labour MP had broken strict Parliamentary rules stating that non-MPs are only allowed in there between 3pm and 5.30pm. The member of staff who points this out waves away his appeal for clemency. Over a pot of tea in nearby Pugin Room, the Bristol North West MP goes on to explain his political philosophy and how he ended up as a key figure in the Future Britain Group, Tom Watson’s vehicle for social democrat and democratic socialist Labour MPs who feel they are not getting a look-in under the current leadership. Jones will co-ordinate the group’s policy work, which aims to produce firm proposals in a range of areas by the end of the year. He is keen, however, to reject claims that it is a party within a party whose true agenda is undermining Jeremy Corbyn. “These groups have existed all the time,” he says. “Jeremy and John (McDonnell) were in their socialist group when we had Blair and Brown leading the Labour party. We’ve had Tribune for a long time too. It’s perfectly normal, based on precedent, that there are groupings in the PLP who want to collaborate and come up with ideas. The ultimate trigger for the group’s formation was the decision by nine Labour MPs to resign their party membership – eight of them to join The Independent Group – in protest at Corbyn’s handling of Brexit and anti-semitism within the party. Was Jones, who was only elected in 2017, tempted to follow suit? “I was invited by The Independent Group to join them,” he says. “I shared some of their frustrations and clearly as the majority of the Parliamentary Labour Party set out, the experience that Luciana (Berger) faced is entirely unacceptable. You need more than words to deal with that, you need action and I’ve not seen that yet. “But my issue with the concept of a new political party in a system where First Past the Post provides an anti-competitive nature, is that I don’t think it would necessarily have a substantive impact on achieving the type of changes that I came here to achieve for my constituents. The former solicitor could not be blamed for feeling less than welcome in Labour’s ranks. He reveals that, despite being elected in 2017, he has yet to have a conversation with Corbyn. Their only contact was a round robin letter of congratulations sent to every new Labour MP following that seismic poll. 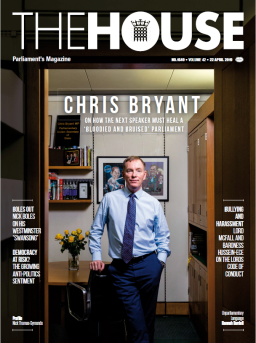 “My understanding is that in the past, leaders’ offices put some effort into speaking to and understanding colleagues in the parliamentary party, but for whatever reason that hasn’t happened,” he says. Having been brought up in a working class household where money was tight, Jones says it was a natural progression for him to join the Labour party. In particular, he says he owes “a debt of gratitude” to the New Labour government which helped to turn around his family’s fortunes. “I remember growing up in an environment where I was always fed and looked after but where I would see my mum choosing not to feed herself in the same way because we didn’t have enough,” he says. “We always had to make decisions about heating and food. We had a shelf above the hi-fi in our flat and mum used to stack the coins and that was how much money we had left, and as you got towards the end of the month you saw the pound coins go, the 50 pences go and the 10 pences go and that is a visual reminder of poverty. Why does he think it is, then, that so many of those who have joined the Labour party since the rise of Jeremy Corbyn never miss an opportunity to decry the record of the Blair and Brown governments? “They’re middle class, right?” Jones says. “They didn’t see first hand or feel the impact of what Blair’s government did. “Financial stress is one of the worst types of stresses. If you’ve got this constant issue where you’ve got bills that can’t be paid, not being able to go on school trips, there’s not enough food, that’s a stressful environment. “My circumstances weren’t because I had feckless parents, they were working really hard and trying to do the right thing, but the system didn’t work for them. However, Jones insists that the Future Britain group cannot simply be a New Labour 2.0, any more than the party’s policy platform can be built on left-wing ideology from even longer ago. He says: “New Labour’s history. Whether it’s Jeremy harking back to Bennite policy mechanisms of the 80s or others harking back to the 1990s – as far as I’m concerned that’s in the history books. Jones concedes that his staunchly anti-Brexit views are unlikely to win favour with the current leadership – he jokes that, having broken the whip on just his second vote as an MP, he may be the quickest Labour rebel in history other than Corbyn. But he hopes that his work with Tom Watson’s new group will stand him in good stead for whatever the future holds for his party.